For Peters fifth film he collaborated with Costa Botes (from Bad Taste) to make this mockumentary on the supposed founder of the New Zealand filmindustry, Colin McKenzie. 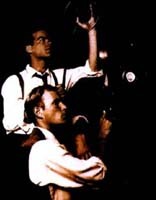 In the documentary, the man was shown to have experimented with colour, developed sound, constructed the mobile camera, and even filmed a man flying an aeroplane before the Wright Brothers flew, when it was all just an elaborate hoax. It is a hilarious look at the film industry in a documentary style that has many reputable people like Sam Neill, Harvey Weinstien, Leonard Maltin. It even has Peter Jackson himself, supported the evidence. When it was screened in New Zealand, it managed to fool half the population, thus being one of Jackson's favourite triumphs. Forgotten Silver is a highly entertaining mockumentary that documents the life and work of pioneer New Zealand film maker, Colin McKenzie. It also follows the equally fascinating contemporary story of how the work of this forgotten genius was brought to life. At fifty minutes it stars Sam Neill, Leonard Maltin and Harvey Weinstein who add authenticity to this "hoax".